New week, new links! As ever, linking isn’t endorsement, and some links may contain disturbing content. If we’ve left anything out, pop it in the comments! Lastly, if I may, rather cheekily: here’s an interview I did with the Singapore Sunday Times, about my newly published novel A Certain Exposure, which, I like to think, has a few feminist themes. Unfortunately it’s not physically distributed in the UK but you can sample a few pages and order a copy of the book here. 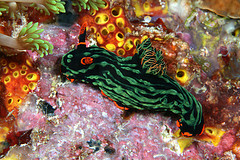 Image shows a colourful nudibranch. Used under a Creative Commons licence thanks to Dolkar2012.